Britain has been hit by the most severe flooding in 90 years and water levels are still rising. It's the Environment Agency's job to manage flood risks and reduce the impact of flooding but some say the organisation has not done enough. Farmers in Somerset claim a lack of river dredging has made the impact of the flooding in their area worse. 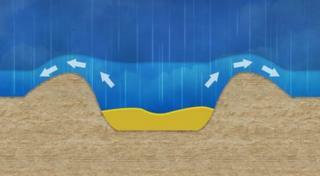 But the issue of whether rivers should be dredged is not straight forward. The Environment Agency says that dredging can improve drainage, but cannot prevent rivers from flooding, due to the huge amount of water involved during major floods. 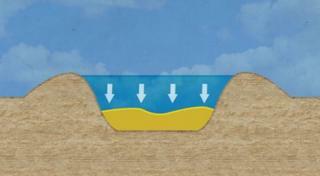 The basic aim of dredging is to remove silt (a material made of fine sand), clay and small particles of rock from the river's bed. The process to remove it usually involves an excavator, or vacuum pump, stationed on a barge or on the riverbank. 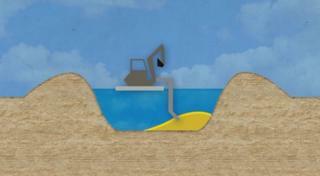 Dredging clears the bottom and sides of the river to enable the waterways to flow freely. Blockages can also be caused by trees, shrubs and weeds. River banks as well as river beds need to be maintained. 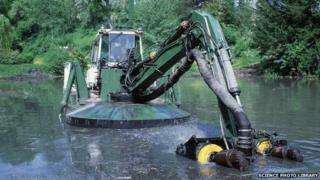 Dredging is expensive and the Environment Agency say that it is harmful to the environment. They believe that it and can weaken riverbanks as well as the foundations of bridges and weirs. The agency also say that dredging can lead to the loss of grounds for fish to breed and can cause loss of some species and destroy the habitat of river bank wildlife such as otters and water voles.